Darla Davis can defend you in all misdemeanor and felony cases, including • DWI • Drug Offenses • DNA-Related Crimes • Sexual Offenses • Family Violence • Thefts • White Collar Crimes • Public Integrity Crimes • Insurance Fraud • Fuel Tax Fraud • Robbery • Homicide • Cold Case Homicide • Capital Murder. 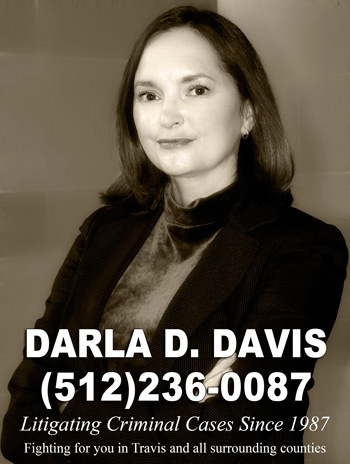 Darla Davis has been litigating criminal cases in the criminal court system for over 25 years. As a former chief prosecutor in four criminal district courts and two white-collar units, Ms. Davis understands the intricacies of how a case proceeds through the criminal justice system - from field investigation, presentation of evidence to the grand jury, indictment, pre-trial hearings and discovery all the way up to jury selection, trial and sentencing. Ms. Davis handles criminal cases in Travis, Williamson, Bastrop, and Hays counties. For a quarter of a century, she has been in the courtroom litigating the full range of cases, from DWI and Drug charges to Assaults and Capital Murder. Ms Davis is of counsel for the Abreo Law Office in Bastrop County. When the Austin Police Cold Case Homicide Unit was formed, Ms. Davis became the "go-to" attorney for unsolved murders. She has worked extensively with forensic experts from across the country in piecing together highly technical evidence. Ms. Davis has tried cases involving DNA evidence, fingerprint evidence, hair and fiber trace analysis and many other forensic categories. Ms. Davis supervised the local White Collar Crime Unit and the Insurance Fraud Unit. She directed document intensive investigations with complex financial transactions as well as those cases involving accusations of official misconduct, embezzlement and fraud. When you or somebody you know has been arrested or charged with a criminal offense, you are facing the power of the State's resources. Get Darla Davis on your side. Bring her experience to your defense.